By John Lennon. Arranged by Chris Arnold. 4 pages. Published by Chris Arnold (H0.334553-393120). Famous song by John Lennon with his vision of world peace. 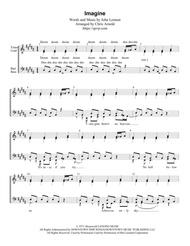 Written for women's barbershop ensemble, it features the bass part on melody. The baritone and bass parts are written using the Bass 8va alta clef, meaning their pitches are sung one octave higher than the traditional bass clef. Middle C is found on the second space of the staff. ﻿This arrangement would also be suitable for SSAA high-school/college jazz ensembles. $12.99 US price includes 4 copies per purchase, suitable for quartets. For choruses, look for the same title available under choral ensembles. Visit us at https://qsvp.com if you have any questions or are looking for learning tracks.